OK guys, juicing is sort of over, right? The new food trend is these home delivery meal systems, but if you're like me, you have found a couple of kombucha or juice drinks at your local grocery store that you stock in your fridge for days you want to increase your veggie intake. There's just something about drinking something green that makes you feel lighter, healthier, and like you can take on a week of healthy eating. I don't think exclusive juicing is a good idea - and used as a cleansing technique with yo-yo dieting can lead to consequences like inflamed gallbladders (and even needing them removed!) Let me know if you'd like to know more about that...perhaps a future post. Finding out if you're partial to kale, spinach, arugala, chard, or other greens is a first step. Arugula has a peppery taste that I actually like. Spinach blends in very easily with other flavors. Apples and pineapple add something sweet to balance it out. So, after diving into that little adventure, and you know, being a dietitian and all, I thought I was pretty knowledageble! But to my surprise, when I triedGreenBlender, I learned some new tricks! GreenBlender delivers a week's worth of produce with smoothie recipes. The ingredients are packaged together so it's easy to put them in your fridge, and pull out the one you want. Everything is labeled - both with the recipe and the ingredient. Clip the recipe sheet to your fridge and you're ready to go. They note certain recipes that are lighter in calories, or higher in antioxidants, and include both the serving size (typically for 2! lucky for your beau or roomie) and the amount of water and ice to add to get that perfect consistency. Bonus - you get wide mouth smoothie straws! Yum. As I mentioned, I thought I knew everything there was to know about healthy smoothies. I thought GreenBlender would just provide convenience by not having to pick up extra produce on my grocery run, or would supplement the other grocery deliveries I got. My first day trying GreenBlender! Sweet Pear recipe with spinach, pear, banana, baobab powder, and hemp seeds! Rose hip powder (or rosehips powder) is one of the most concentrated forms of vitamin C you can get. When a wild rose falls off, it leaves a rose hip, which is the fruit of the plant. No icky flavor with this addition! Baobab fruit powder is another antioxidant powerhouse. I had never heard of it! Perhaps you're more knowledgeable than me, but if not: baobab powder is from a tangy citrusy fruit, and loaded with vitamin C. It also boasts some impressive mineral content. Hemp seeds are packed with fiber. So easy to add a bit to your smoothie without altering the taste or texture at all. 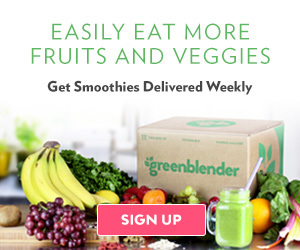 So with a GreenBlender subscription, not only do you get the convenience of produce and smoothie recipes delivered to your door, which is a great way to change up any routines you have, and add produce to your home delivery. Easily add your go-to protein powder to punch these up to a post-workout drink, and take comfort in knowing that for each recipe, you get two servings! If you think GreenBlender is something you want to try, I'm so excited to offer you $10 off your first box. It's a great way to give it a try without shelling out your week's grocery budget. Just click the link below, and use coupon code GBSAVE10 when you check out. Any questions? Hit me up in the comment section.